Click here for Complimentary Photo Gallery Download! Above: Billy Harrison will be one to watch this weekend at Bells Beach as he vies for a spot in the Rip Curl Pro. Xavier Huxtable, India Robinson, Sophie Fletcher, Billy Harrison, Bella Wilson, Caiden Fowler, Joe van Dijk. Bells Beach, VIC/AUS (Tuesday 20th March 2018): This weekend will see the top Victorian Surfers battle it out for a spot in the Rip Curl Pro Bells Beach as part of the Visit Victoria Trials. As part of the Victorian Government’s commitment to Victorian surfers, the Visit Victoria Trials offers a wildcard into the main event for one male surfer with a combined Victoria and Rip Curl Trials for the women. 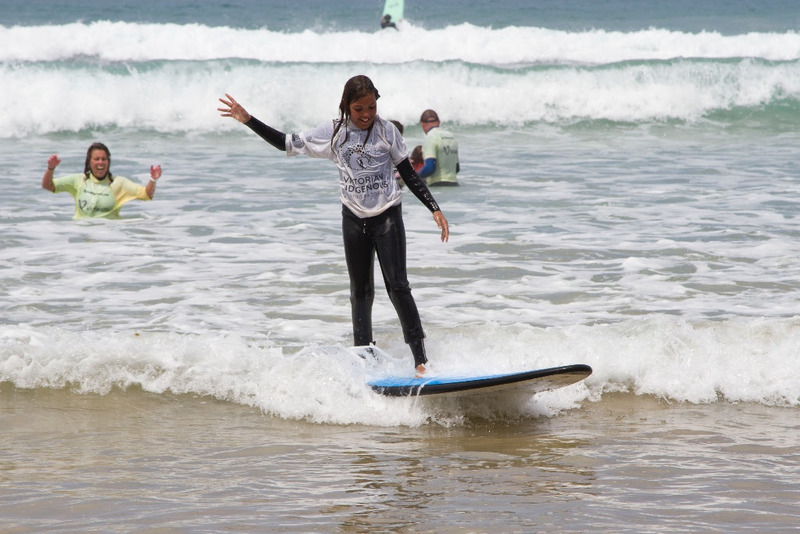 “The Visit Victoria trials is an integral part of our development pathway” said Surfing Victoria CEO, Adam Robertson. The singular female wildcard is determined by a heat including 2x Rip Curl surfers and 1x Victorian surfer. The two male wildcards are allocated to Rip Curl and the Visit Victoria Trials. Notable Victorian surfers competing across the two days includes former trials winners Tim Stevenson (Jan Juc), Jack Perry (Jan Juc), Cahill Bell-Warren (Bells Beach), Glyndyn Ringrose (Phillip Island) and Zoe Clarke (Jan Juc) along with Qualifying Series competitors Billy Harrison (Barwon Heads), Xavier Huxtable (Jan Juc), India Robinson (Jan Juc) and Sophie Fletcher (Phillip Island). Competition will begin on Sunday at Bells Beach with a call to be made at 7:30am. Heat Draws and live scores will be available at www.liveheats.com/surfingvictorialater in the week. The Visit Victoria Trials is presented by the Victorian Government and supported by the World Surf League, Surfing Victoria and Rip Curl. World Surfing League CEO Sophie Goldschmidt said, “WSL fans can expect to see some wonderful additions to our Australian series including the awarding of the AirAsia Big Air© at the Quiksilver Pro on the Gold Coast, Rip Curl Pro at Bells Beach and the Margaret River Pro. 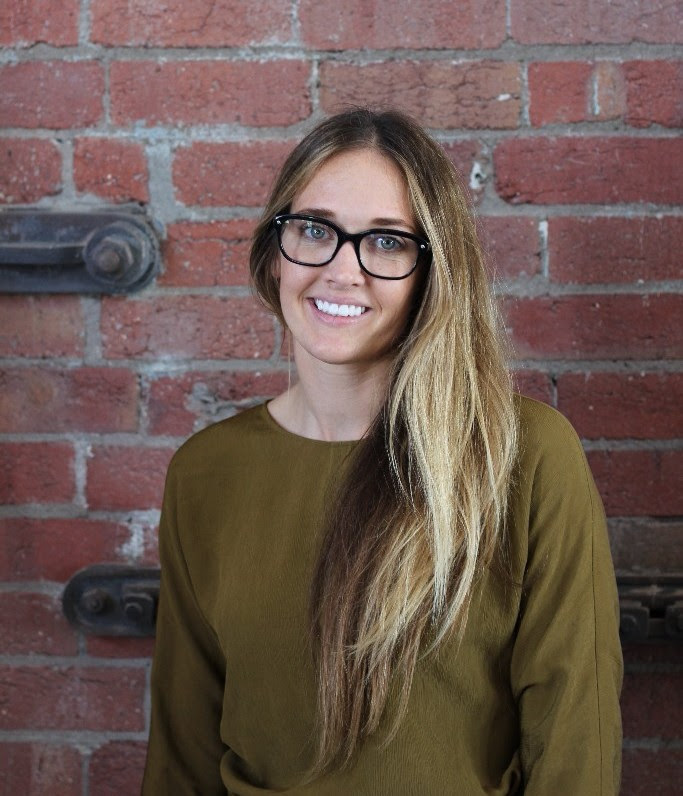 Torquay, VIC/AUS (Friday 16th March 2018): The Board of Surfing Victoria are pleased to announce the appointment of Ashleigh Wall as the new Chairperson as of March 13, 2018 taking over from the outgoing Paul Robson. Ms Wall is the first female chair of Surfing Victoria. Joining the Board of Surfing Victoria in 2014, Ms Wall is an experienced corporate lawyer, passionate sportsperson and advocate for corporate social responsibility within the state. Growing up in the Victorian coastal town of Barwon Heads, Ms Wall began surfing as a teenager and was an active member of the 13th Beach Boardriders club. This saw her become a junior and open female champion at the club. Key priorities for Surfing Victoria under Ms Wall’s leadership will be to continue to work with key stakeholders to increase participation in all levels of surfing and promote gender equality through such things as its female stand up paddle boarding program Coasting. “We have introduced some fantastic programs which are working to increase participation and a level playing field for women and girls, and indigenous Australians, in all areas of the sport and this will continue to be a focus.” said Ms Wall. 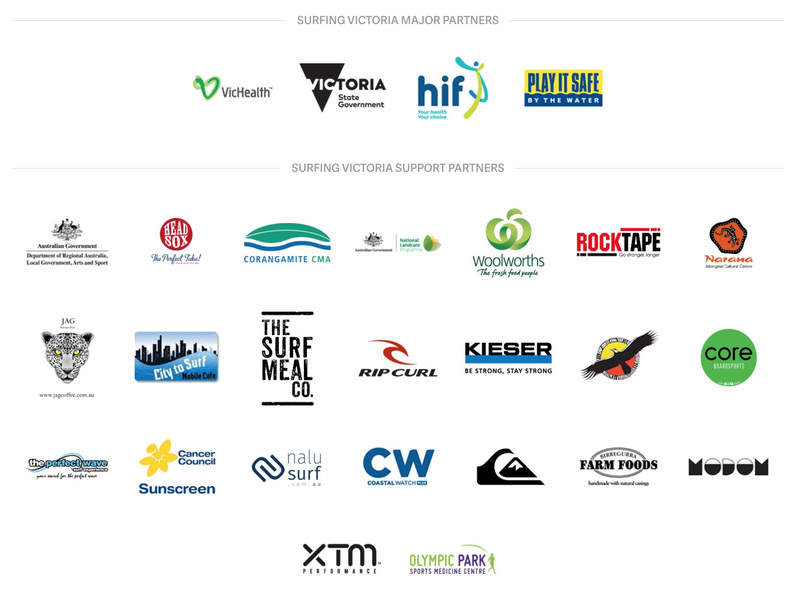 “I am honoured to be stepping into the role at such an important time in Surfing Victoria’s growth, and look forward to working with the Board and our CEO, to build on our strong foundations as a progressive, inclusive and leading sporting organisation” said Ms Wall. Surfing Victoria CEO Adam Robertson is looking forward to having Ms Wall’s experience leading the organisation. Welcome to the latest news from Cycling Victoria! This weekend promises to be huge, with both 'The Amazing Ride' and Mansfield Tour taking place. Best of luck to everyone participating! As always, please call Cycling Victoria (03-8480 3000) or email us if you have any questions. The Amazing Ride is fast approaching! 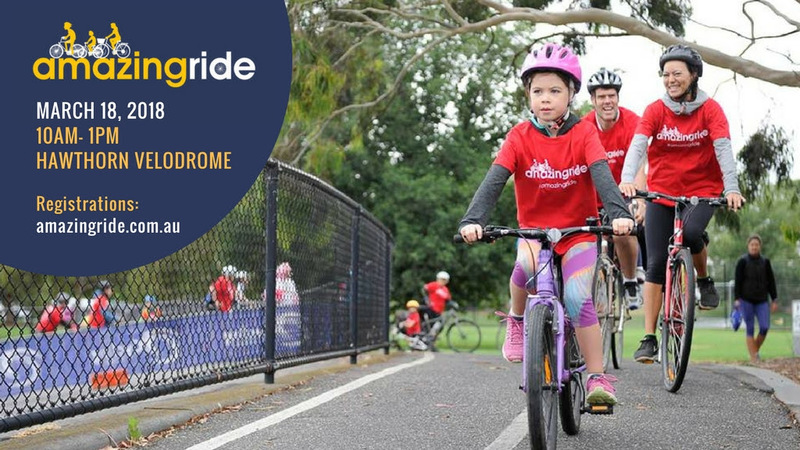 Families across Melbourne are set for a fun-filled day on their bikes this Sunday March 18 at 'The Amazing Ride’. With three ride options (1km - 14km - 32km) starting and finishing at the historic Hawthorn Velodrome, participants will have the opportunity to complete as many or as few of the routes as they wish over a three hour period. On-line entries will close at midnight on Thursday March 15. And just a reminder that everyone who enters on-line will receive a free event T-shirt and rider pack. Don't miss what promises to be a great day! Event 2 of the 2018 'Towards Zero' Victorian Road Series will take place this weekend, with the running of the Mansfield Tour. 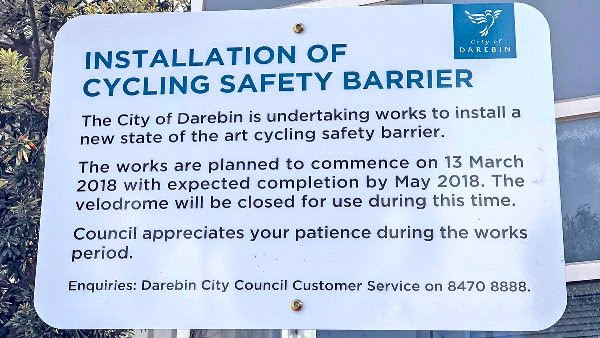 Just a reminder that the Darebin International Sports Centre (DISC) Velodrome will be closed between March 13 & May 7, 2018. If you have any questions please don't hesitate to contact Alan Mok. Cape Woolamai, VIC/AUS (Saturday 3rd March 2018): Joe Van Dijk (Smiths Beach) and Zoe Clarke (Jan Juc) have taken out Round 2 of the Victorian Open Series presented by HIF Australia held at Woolamai Beach. Competitors were greeted with pumping conditions with the Woolamai banks lighting up all day delivering major scoring potential for all surfers during the course of the day. Earlier in the day many competitors found themselves entrenched in some amazing barrels. The Open Mens division was hotly contested all day with many heats going down to the wire. Getting the nod in the end was current WQS surfer Joe Van Dijk (Smiths Beach) who in the final showed his local knowledge to score a 16.80 out of a possible 20 point heat total. "The waves were really fun out there". Van Dijk said. "I'm stoked to get the win here at home, I was lucky to get a few good ones". Coming in a slender margin behind in 2nd was Tim Stevenson (Jan Juc 16.06) with Carl Wright (Phillip Island 15.50) trailing in 3rd, whilst Tristan Forras (Jan Juc) came in 4th with an 11.40 heat total out of a possible 20 points. In the Open Womens Division, former Open Champion Zoe Clarke (Jan Juc) took a convincing win in the final finding a number of fun Woolamai walls. "The waves were amazing out there". Clarke said. "I can't wait to get back out there after the presentation, it's pumping". Finishing in 2nd, charging throughout the whole day was Angela Ball (Jan Juc), with Sophie Fletcher (Phillip Island) and Bella Wilson (Jan Juc) finishing in 3rd and 4th respectively. The Victorian Open Series is presented by HIF Australia and supported by Coastalwatch, Rocktape and City to Surf Mobile Cafe. Round Two of the Victorian Open Series presented by HIF Australia will head to Phillip Island this weekend with the expectation of excellent surf on Saturday. The premier Open surfing series in the state brings together the best surfers in some of the best waves in Victoria, culminating at Bells Beach in September. Day 1 of the first round of the HIF Victorian Longboard Titles presented by City to Surf Mobile Café kicked off in small waves at Clubbies (13th Beach) on the Bellarine Peninsula last Saturday. On Day 2 due to poor surf, the event was postponed. Competitors will be notified of the new date in the coming weeks. The Woorrangalook Victorian Koori Surf Titles was held over the weekend at Urquhart Bluff on the Great Ocean Road. More than 120 indigenous surfers from across the state gathered to celebrate the 20th annual event, which brings together indigenous communities in a fun weekend of surfing and indigenous culture. The Rip Curl Pro is celebrating 57 years and the world's best male and female surfers are in town to compete for professional surfing's most treasured trophy - the Rip Curl Pro Bell. The Rip Curl Pro is the second event on the 2018 World Surf League (WSL) World Tour. The event holds a very special place in surfing folklore, as the longest running world championship level contest on the World Tour. The highly successful Surfers Rescue 24/7 program was launched this morning by Surfing Victoria as part of the Victorian Governments Play it Safe by the Water initiative. Initially developed by Surfing NSW in response to research that found surfers complete more than 50% of rescues in the ocean, the program has been expanded to Western Australia and now Victoria. 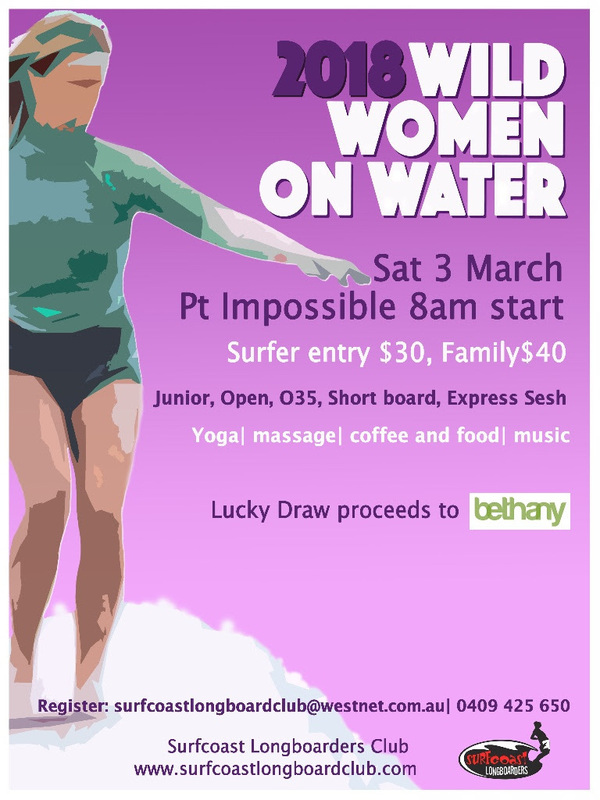 The 9th annual WWOW women's surfing event will be held on Saturday 3rd March, 8am at Point Impossible, Torquay. Sign up here for a day filled with fun and friendship and hopefully some memorable waves. Some giant swells today for the @RipCurlPro at #bellsbeach. It makes spectacular viewing, but as LSV's Liam O'Callaghan said: "If it's too big, leave it to the professional surfers this weekend." Take care near the water tomorrow, especially at high tide and while rock fishing. We will be ringing a few Bell's tomorrow! Men's Quarter Finals have been set and will be first up tomorrow morning. Photo - The Rip Curl Pro Women's Semi Finals have been set! The Rip Curl Pro Women's Semi Finals have been set! Who will be ringing the Bell tomorrow? All Westerfolds 2019 attendees get 15% off entry into one of the Mega S&R events! Visit msmegasquash.org.au for more information, offer ends Tuesday April 30th. Have you nominated your club members for our Valuing Volunteers Evening and our Awards of Excellence? Nominations close tonight! There are only a few days left to enter round four of the 2019 Towards Zero Victorian Road Series. We are very excited to showcase new courses in the Lindenow and Swan Reach areas. There is plenty to enjoy in the area with great local cafes, wineries and breweries and restaurant scene showcasing local produce. The annual Westerfolds Open kicks off tonight at Westerfolds Sports Centre. The Custom Squash Victorian Grand Prix Circuit will be hotter than ever! Here's everything you need to know! When you think about networking do you (A) run in the opposite direction or (B) see it as an opportunity to pitch you, your brand and develop new meaningful and often purpose driven connections? Regardless of your answer or your personality - imagine if you stepped back and started to approach networking with a different mindset; if you saw it as a chance to build your brand and support network around you. LSV is hosting our first FLN evening event for 2019 on Thursday, May 9 at 200 The Boulevard, Port Melbourne. Guest speaker, Renee Robson, will take you on a journey of her career and how being open minded and putting herself out there has provided her with many unique and exciting opportunities. Renee will provide participants with new tools and tricks and discuss how you can still succeed at networking, even if you do feel a little bit uncomfortable. Join us and Renee for an exciting evening of insight, growth and networking >>> book here now! Life Saving Victoria (LSV) is urging Victorians to be extra careful in, on and around water tomorrow, Friday 26th April 2019, as large seas are expected. The Bureau of Meteorology predicts large wave heights through western Bass Strait on Friday and into early Saturday, accompanied by gale force, south-westerly winds as the cold front takes away the Indian summer we’ve been experiencing. Between 8-9m swells are forecast for the coastline between the Victorian border with South Australia and Cape Otway. Photo - REMEMBERING OUR GLORIOUS CYCLING SOLDIERS. REMEMBERING OUR GLORIOUS CYCLING SOLDIERS. On this ANZAC day, we remember how many soldiers sacrificed their lives for the great freedom we enjoy today. Those soldiers came from all walks of life including our cyclists from Victoria. One such soldier and cyclist was John Alexander James STENHOUSE, a member of the Williamstown Cycling Club. He enlisted in the army and was deployed to the front in 1916. He was injured there and sent home to recover. He was re-deployed the following year but died at Villers-Brettoneux on the 20 March 1917, age 25. The medals he won in his short cycling career were fortunately saved and have been handed down through the family. There are six medals in the collection, all in excellent condition, and they have been donated to the Cycling Victoria History Archive. The top medal, the Barnet Glass Road Race, was a 90-mile handicap from Bendigo to Melbourne in 1912, finishing in Mt. Alexander Road Essendon. John Stenhouse finished in 22nd. place, well inside the allocated time limit, and received this medal. The second pictured medal was for an important annual Williamstown Club race. It was presented by, and obviously in respect of, the influential Club President Mr. T. W. Ward. Newspapers reported that the Fastest Time Medal won by John Stenhouse was gold, a valuable prize indeed. Alas, it was to be his last cycling medal. This Saturday night at Redline Raceway, five classes will compete on track championship night for all classes with winners earning the coveted Redline Raceway track champion sticker along with the trophies or sashes they earn, the Sports Sedan’s will double up as the next round of their ‘Mental Racewear’ Stampede series whilst the AMCA Nationals compete in their state series round. The Sports Sedan line-up includes Leigh Bourke currently second in the point’s standings and looking to continue on after recent terrific results and secure the win. Competition will be strong with Ricky Ashmore, Ricky Cornwall, Jack Van Bremen, Zac Swanson, Daniel Carter, Russell and Daniel Smith are amongst the list of challengers. Carter will be looking for a strong showing with his eye on the club championship points on offer also having had a consistent season. Cornwall and Van Bremen are two young drivers to keep an eye on. AMCA Nationals action will once again see Dean Heseltine and Tim Reidy against each other. However Rodney Bassett from Tasmania is a top national competitor and has other ideas as do Grant Cullinger, Neale Peachey, Keenan Casey and Frank Thierry. Running with 350ci crate engines the V8 class is strictly controlled keeping everybody close together on track. Ability always stands out at the end of the night. Street Stock action will once again see Jason Degoldi trying to continue on his strong Redline season. He will have to drive to his best to defeat Brad McClure, Darren Giacometti, David Barrie, Jason Duell and Jayden Blomeley. Degoldi is in winning form having won this past Easter weekend, Blomeley won the weekend before that, watch for those two at the end of the night. In Unlimited Sedan action Sean Lister in his 410ci powered race car is the standout driver in the field however Cameron Impey has kept him honest on the occasions they met this season. Scott Purdie returns to V8 racing in the family race car whilst David Ricketts competes in a car that Trent Susol has won two feature events in already this season. Finally the Standard Saloons round out the night with Paul Domburg from Portland the most favoured of entrants. Nicole Vaughan, Dean Pedersen, Hayden Clifford and Mark Seller are other entrants to keep an eye on. Gates to the public open at 2pm, aiming for a 4pm race meeting start. Entry is Adults $25 & Pensioners $20 Kids 5 to the age of 15 $5 or a family $60 (2 adults & 4 Kids) fully catered venue, no BYO as per law. A donation portal for all three lifesavers from @pcslsc who were involved in the Easter Sunday rescue mission, which tragically resulted in two lifesavers losing their lives at sea and one recovering in hospital from serious injuries, has been set up. To donate, please go to www.slsfoundation.com.au/portcampbell. Thank you to the global lifesaving family for the incredible support shown so far. Interested in pool lifesaving competitions? Join us on Sunday 28 April at @MelbourneSportsCentres MSAC to try your hand! The session is ideal for those athletes and clubs that want to understand more about pool lifesaving. The sessions will assist athletes in developing the fundamental skills of manikin tow, manikin carry, obstacle races and line throw, and will also help aspiring club coaches and team managers understand the basic skills of the pool lifesaving events to take back to their club training sessions. Rising Tides is a fantastic initiative from the World Surf League that brings together young girls at each World Tour stop to get a chance to surf with their female surf heros. At Bells, the group of 50 Victorian girls got the chance to surf with Stephanie Gilmore, Nikki van Dijk, Carissa Moore, Courtney Conlogue and had a special visit from 10x Bells Beach champion Gail Couper! Photo - Are you still hunting for the perfect gift to give your mum on Mothers Day? Are you still hunting for the perfect gift to give your mum on Mothers Day? Cycling Victoria is hosting our Come 'N' Try Track Day at DISC this mothers day (Sunday, May 12) and we are offering a discount for all mums; join us for only $20 (usual price $25). Track bikes are supplied if you don't have your own. A helmet must be worn at all times when riding the track. Final Call | Entries close this Tuesday April 30th for the 2019 Secondary School Squash Competition! Each team will consist of 3 players, competing in a round robin format, in 15 minute matches of point-a-rally scoring! Last week we received a request from Hawthorn Cycling Club's Sean Vintin asking whether we would allow him to race both the aero and non-aero categories at this weekends Victorian ITT Series opener. We allowed for Sean to enter both categories, but also wondered why someone would want to suffer twice? So we put some questions to Sean over Easter to see what he had to say. Photo - #ICYMI Squash & Racquetball GO! is back and re-vamped as a 6-week program ‼️6? This VicHealth funded initiative is a great way for young people aged 12-17 to try squash or racquetball in a fun, safe and inclusive environment. While our thoughts have been closer to home this Easter, we haven’t forgotten the people of Sri Lanka during the devastating events occurring in their country, one that Life Saving Victoria has partnered with over the past 8 years to share lifesaving skills. Over fifty of our young lifesaving members have travelled to Sri Lanka with our programs, starting in Negombo, where the community was so badly affected. We have had the privilege of working with local communities, government agencies, businesses, the police, military forces and lifesaving partners. We have been received with respect and treated with immense kindness and hospitality. No surfing today with an official lay day called. A later start tomorrow - 9am call for competition! The Super Rods contested night three of the Max Dumsney Motorsport Super Rod Easter trail at Warrnambool’s Premier Speedway on Easter Sunday in conjunction with the prestigious Super Rod Cup where it was Lancefield’s Shaun Walsh who secured the win ahead of Cobden’s Michael Coad and Peterborough’s Ewan McKenzie. The first heat of the night saw Howard Stansfield claim a green to checker win when he led home Paul Verhoeven with Trevor Perry home in third. Heat two saw Coad take home the win with Walsh second and Jamie May rounding out the top three. Neville Gange took the early lead in the third heat, with Walsh and Stansfield in hot pursuit, in lap eight Walsh was able to elevate himself into the lead continuing on to take the win from Gange and Stansfield. The final heat of the night saw Gronbeck take the early lead only for the race to come to a halt after one lap when the car of McKenzie rolled with driver ok but unable to continue. From the restart May took his opportunity to move forward taking the win ahead of Adrian Rieck and Jason Kavanagh. A pole shuffle was contested by the top eight competitors with a series of two lap dashes taking place. In the first pairing it was Perry and Rieck, with Rieck taking the win and moving forward to challenge Verhoeven. This time it was Verhoeven who maintained his position advancing to challenge Gange. Verhoeven capitalised on his chance to move forward with Gange starting from sixth. The challenge for fourth position saw Coad secure the win, with Stansfield the victor in the next duel. May claimed the win over Stansfield in their pairing to move onto to challenge Walsh for pole position. Walsh made the best of the starts with May in hot pursuit, however at the drop of the checker it was Walsh claiming the number one position. The line-up for the 33rd running of the Super Rod Cup saw Walsh and May making up the front row, followed by Coad, Verhoeven, Gange, Rieck, Perry, Jason Kavanagh, George Woolstencroft, Clinten Scott, Paul Singleton, Troy Hose, Jim Gronbeck, Amy Duynhoven and McKenzie. With Gleeson and Darryl Nelson sidelined with engine issues and Stansfield also an omission with ignition problems. With twenty laps on the board it was Walsh who made the best of the starts leading away from Verhoeven, Coad and May. Walsh took charge of the race with Coad moving into second in lap four. They continued in this fashion with Walsh continuing to set the pace, from Coad, with Verhoeven and Gange locked in a fierce battle. In lap fifteen the race came to a red light stoppage when the car of May came to a smoky halt when his engine detonated. Walsh maintained his lead from the restart from Coad, Verhoeven, Gange and McKenzie now well and truly engaged in the fray. With McKenzie accounting for Gange in lap seventeen and Verhoeven with two laps remaining. But it was Walsh who was never headed who went on to claim his third Super Rod Cup ahead of Coad, with McKenzie moving from his 15th starting position to claim third. Next was Verhoeven, Gange, Perry, Singleton, Woolstencroft, Rieck, Gronbeck and Duynhoven. At the presentations Walsh thanked Max Dumnsey Motorsport for their contribution over the Easter Weekend along with Avalon, Borderline and Premier for making the event happen. Walsh also thanking his brother and the car’s owner Andrew Howard along with all of his crew and sponsors. The Super Rod’s next meeting will be on next Saturday 27th of April when they take to Hamilton’s Western Speedway. The Super Rods took to Mt Gambier’s Borderline Speedway on Saturday 20th of April when they contested round two of the Max Dumsney Motorsport Super Rod Easter Trail. It was Colac’s Neville Gange who claimed the win ahead of Shaun Walsh and Ewan McKenzie. In the first heat of the night it was Peter Duynhoven who took an all the ways win when he led home Paul Verhoeven and McKenzie. Gange was the victor in heat two when he led home Howard Stansfield and Troy Gleeson. Heat three saw Walsh with a green to checker win in a close race with Gleeson second and McKenzie third. The final heat of the night saw Jamie May lead the race in its entirety with Michael Coad and Neville Gange hot on his heels for second and third respectively. The grid for the final saw Gange and Walsh making up the front row, they were followed by Gleeson, McKenzie, Verhoeven, May, Coad, Stansfield, Adrian Rieck, George Woolstencroft, Paul Singleton, Trevor Perry and Troy Hose. Gange made the best of the starts leading away from Walsh, McKenzie, Gleeson and Duynhoven. With Gange in the lead a fierce battle ensued behind him before the race came to a caution in lap two with Perry stationary on the track. As the race resumed it was Gange that led the way from Walsh hot on his heels throwing everything at the leader, while Gleeson and McKenzie also engaged in a fierce duel swapping positions a number of times throughout the race. Gange was able great a slight break from the persistent Walsh while McKenzie was able to secure third position. Gange went on to take the win in a flag to flag performance, with Walsh home in second and McKenzie third, followed by Gleeson, Coad, Duynhoven, May, Perry, Hose, Verhoeven, Rieck, Singleton and Woolstencroft. The Super Rods took to Geelong’s Avalon Raceway on Good Friday to kick off round one of the 2019 Max Dumsney Motorsports Super Rod Easter Trail together with the 3CS Cup. It was Warrnambool’s Troy Gleeson who claimed victory when he led home Peterborough’s Ewan McKenzie and Lancefield’s Shaun Walsh. With heat racing underway it was Neville Gange who secured the first win of the night when he took a flag to flag in a close finish with Jason Kavanagh second and Darryl Nelson third. Heat two was an all the ways win for McKenzie when he led home Walsh and Gleeson. Gleeson was the victor in heat three when he was able to account for early race leader Adrian Rieck in lap five, with Rieck finishing second and Paul Verhoeven rounding out the top three. The final heat of the night saw a green to checker win for May ahead of Howard Stansfield and Corey Deglaitis. With fifteen laps on the board it was Gleeson and McKenzie making up the front row, they were followed by Gange, May, Walsh , Rieck, Nelson, Kavanagh, Michael Coad, Stansfield, Troy Hose, Deglaitis, Verhoeven, George Woolstencroft, Paul Singleton, Peter Duynhoven and Trevor Perry. It was McKenzie who made the best of the starts leading away from Gleeson, Gange, May and Walsh hot on his heels, with Gleeson moving into the lead in lap four. A caution in lap five saw the field regrouped with Gleeson leading the way from McKenzie, Gange and Walsh. Gleeson was able to take a comfortable lead while the battle for the minors was still in dispute with Walsh moving into third in lap ten. At the drop of the checker it was Gleeson who went on to claim the victory ahead of McKenzie and Walsh in third, then came Gange, Nelson, May, Stansfield, Deglaitis, Coad, Kavanagh, Rieck, Verhoeven and Singleton. Rainbow Bay SLSC observed a minute’s silence earlier today in honour of the Port Campbell SLSC members who lost their lives in the line of duty yesterday. Members right across Queensland stood alongside lifesavers nationally in marking their respect for the Victorian lifesaving community following the tragic passing of two lifesavers on Easter Sunday. On behalf of the members of Port Campbell Surf Life Saving Club, I would like to sincerely thank you all - our members, the incredibly supportive local community, emergency services workers and the wider lifesaving community, for the overwhelming support you have given us following yesterday’s devastating incident. To read so many beautiful messages of support has touched our hearts and we thank you. We know you’re all feeling the loss with us, and it gives us and the families strength. Port Campbell Surf Life Saving Club President. Photo - Have you registered your team for MS 24 Hour Mega Squash & Racquetball?! Have you registered your team for MS 24 Hour Mega Squash & Racquetball?! Photo - #ICYMI Squash & Racquetball Victoria is now on LinkedIn ! #ICYMI Squash & Racquetball Victoria is now on LinkedIn ! Be sure to follow us for exclusive updates! As a mark of respect, patrolling members across Victoria are encouraged to share a minute’s silence at 12.30pm today to honour the lives of the two Port Campbell SLSC members who lost their lives in the line of duty yesterday, and to send our thoughts to the third member, who is still recovering in hospital after the tragic incident. It’s the last day of a very busy summer season on our beaches and I send you all a heartfelt thank you for the service you have given to your communities. Our lifesavers and lifeguards performed 523 rescues since the 1st December 2018, as well as 2,950 first aid applications and 132,813 preventive actions. Thank you for your dedication and bravery. Please take a moment today at 12.30pm to face the water and reflect in silence on the achievements your patrols have shared over the season and as a mark of respect to the highly-regarded lifesavers who sadly lost their lives at sea this Easter. On Easter Saturday night at Bairnsdale Speedway four race divisions competed on the final show of the clubs season with two feature events for Wingless Sprints and Standard Saloons supported by Sprintcar and Limited Sportsman competition. The Gary Bowden Memorial Cup for Wingless Sprints would be won in emphatic fashion by Travis Millar whilst in Standard Saloon competition the Easter Classic was won by Glen Pendlebury. Alistair Bastian was sensational on his way to a LS Sprintcar feature event win whilst Tim McKenzie won the Limited Sportsman final. Wingless Sprintcar entrants were honouring the late Bairnsdale man Gary Bowden who was heavily involved with Bairnsdale Speedway, the Wingless Sprints and local business before passing away a few years ago. It meant more to others to win the event and in the end, working his way from ninth spot on the grid Travis Millar who was racing when Bowden was involved with Wingless Sprints went on to storm his way to the front and go on to the win. Millar had to pass eight other drivers on his way to the win that included Kim-Loong Gosling, Michael Lovell, Viv Rockliff, Daniel Mayson, Brad Foster, Jamie Mills, Steve Loader and Travis Evans. Evans led the first seven laps before losing the front running position to Loader. By lap nine Millar was in third spot chasing Evans and Loader and he had the lead by lap thirteen of thirty. From there he was never headed and went on to win from Mills, Loader, Evans and Brad Foster with Millar at times half a second per lap faster than others. In qualifying events Morwell racer Darryl Logue had a big crash in turn one finishing his night, shaken and a little stirred. In the Easter Classic for Standard Saloons Glen Pendlebury was up against tough competition from another local Bairnsdale member Josh Thomas along with Jacob Vuillermin, Kane Gibson, Patrick Vuillermin and Matt Bowers amongst others. The twenty lap final event was led from the start by Pendlebury with Thomas chasing ahead of Jacob Vuillermin. It took until lap nineteen for there to be a change in second place with Vuillermin passing Thomas, however Pendlebury went on to an all the way win ahead of Jacob and Patrick Vuillermin, Bowers and Thomas rounding out the top five finishers. In the Sprintcar feature event following the Victorian title the night before at Rosedale Speedway, Alistair Bastian and Daniel Orr began from the front of the field after the qualifying heat runs. Bastian blew away from the field on lap one with Orr, Mark Laity, Adam Greenwood and Justin Bowen chasing. On lap three Bowen had a big crash between turns three and four leaving the first time driver out of the race. Until then he was quick and had shown enough to warrant another go in Sprintcar racing down the line. At the ten lap mark Bastian was still in command ahead of Orr, Greenwood, Peter Laity and Michael Evans and by lap thirteen new Victorian champion Mark Noonan moved into fourth as Peter Laity exited the race. At the chequered flags, Bastian had taken the win from Orr, Greenwood, Noonan and Evans. Another driver to suffer big damage earlier was Dillon Siely who had just made a sensational turn one and two pass around three other entrants before he slammed into the back straight concrete two thirds of the way down. That ended his night with the car severely damaged. Finally the Limited Sportsman put on some very good racing in a small field with Mark Both, Tim McKenzie and Chris Woeltjes giving Darren Adams a hard time. Both initially led the feature race from McKenzie, Woeltjes and Adams before Both’s car suffered front end breakage and Woeltjes slammed his car into the back straight concrete wall. McKenzie then worked his steering wheel hard to hold out Adams and at the drop of the chequered flag victory was his with Adams finishing second and Brett Maxwell back in third place. The Bairnsdale Speedway Club season is now over and the volunteers and drivers plan ahead for the presentation night and for next season. On behalf of Life Saving Victoria, I would like to pass on to our members the tragic news of the drowning of two of our highly-experienced and respected volunteer members today. They were long-standing members of the Port Campbell SLSC, who sadly died in the line of service while performing a rescue with another member, who is currently recovering in hospital. This is a tragic outcome and our hearts go out to all involved – the friends and family of the deceased members and recovering member, as well as to the wider community of Port Campbell, the Port Campbell Surf Life Saving Club and the wider lifesaving community, who we know will share our deep sadness about today’s incident. We also extend our condolences to other emergency services affected, in particular the CFA and SES, and commend those who worked so hard from other emergency services agencies today in the rescue efforts. LSV is providing support locally and extends the offer of support to the wider lifesaving community, who may feel deeply saddened and affected by this tragic incident. Please don’t hesitate to call LSV Comms if you feel you need support.